This is my first post in English on my blog. First of all, I apologize for my weakness in English grammar. I have decided to write it about Italy in the Second World War. The reason is simple: I want to give an Italian perspective on this matter to Anglo-Saxon readers. I am reading the weighty book by Gerhard L. Weinberg A World at Arms, and among several positive things, I find some topics, if not questionable, at least worth of a discussion. Benito Mussolini was a 21st century ante-litteram politician: for him, communication and self-branding were far more important than the brute reality of facts (cc 4.0 F.Romano10 via WikiCommons). Before the inglorious defeats at the end of 1940, Italy’s military power was widely and highly overestimated. 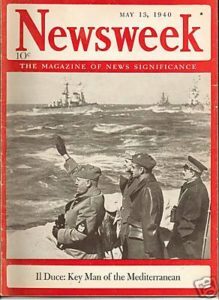 This is the cover of May 13, 1940 issue of Newsweek magazine, headlining: “Il Duce: key man of the Mediterranean” (Public Domain via Wikipedia). I don’t have a good opinion about the Anglo-Saxon historiography about the Italian participation to the Second World War. Its well-established tradition treated Italy as a kind of no belligerent. The only exception was by British historians considering the renowned victory of Operation Compass in Libya, whose importance for British morale and will to fight was second only to the epic Battle of England. But afterwards, only Germany really fought, and Italy and its colonies are considered only as battlefields. This is the perspective, for example, of Sir Basil Liddell Hart, an author, however, I esteem very much. The storytelling is simple: El Alamein, the great British victory against the mighty Rommel; on the other side of Northern Africa, Torch and the defeat at Kasserine Pass as a baptism of blood for the U.S. Army; then the great landings in Sicily, Salerno and Anzio, the lock of the Gustav Line. After all, for almost a year, Italy was the Western Allies’ main front in Europe. On June 6th, 1944 Italy disappeared: after D-Day, all the things that matters were in France. Italy: the Last of the Main Characters or the First of the Walk-on Extras? I totally agree, Italy had a little importance as World War Two belligerent. It was hopelessly weak, both in armaments and economic resources, it had hideously clumsy high-ranking military officers, and, more important, it lacked the will to fight. And this was, after all, a great luck: imagine how things could have been if Italy had been able to Wehrmacht-like conquests in Africa and Middle East. An abandoned Italian Fiat Ansaldo CV33, 26 July 1940. 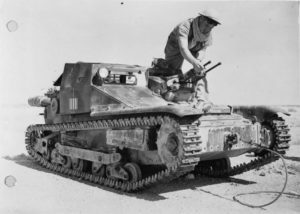 That is, a Bren carrier used as a main battle tank (IWM, Public Domain). Worse of the weakness, Italy fought on the wrong side, and suffered a very inglorious and disonhourable defeat. This has provoked a deep and bad wound to the Italian self-consciousness, emerged with great difficulty during the previous war, with the cruel battles of the Isonzo, the resistance after Caporetto, and the final offensive on the Piave river. It is a wound, in some respects, still open today, considering the enormous difficulty for Italians to conceive themselves as a unique people, and the loss of international prestige that their country is paying still today. Is the Lack of Knowledge of Italian Historiography Justifiable? 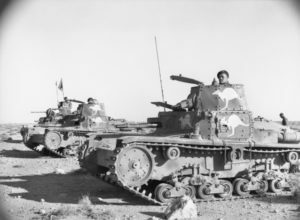 Captured Italian M13/40 (far left) and M11/39 (middle and right) tanks being used by the Australian 6th Division Cavalry Regiment during the capture of Tobruk, 23 January 1941 (Public Domain). However, all those things don’t justify the unawareness of Italian sources and historians by the Anglo-Saxon historiography. The only historian that seems to have a good knowledge in this field is Denis Mack Smith. The other British and American historians show a good knowledge, in addition of course to the archives of their countries, only of the French and German sources. For example, Weinberg’s book grounds all its treatment of the Mussolini’s decision to go to war only upon a single work, Mussolini Unleashed by MacGregor Knox. Yet, reading the monumental biography of the “Duce” written by Renzo de Felice would have been very useful. Italian historians began very early to dig up the causes that brought their country to such a catastrophe. 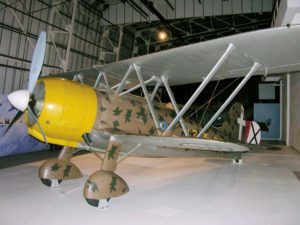 The very symbol of the technological outdating of Italian armaments: the Rosatelli’s FIAT C.R.42 “Falco” (CC 1.2 Oscareagle via Wikipedia). 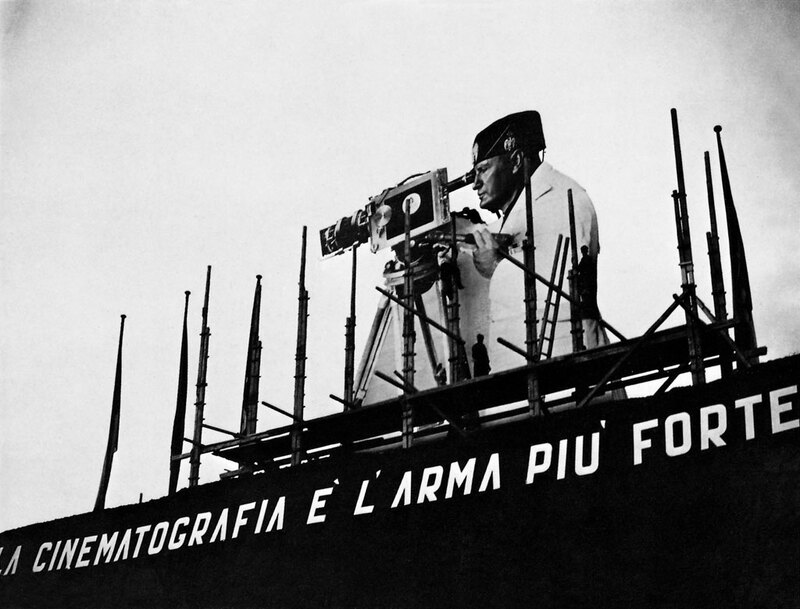 The mainstream storytelling on which the Italian Republic was founded, that is, the fall of the delegitimised Fascist regime, one and only responsible for the war; the brutal German invasion; the brave and to a man resistance to the invader by the Italian people; the co-belligerency of the renewed and legitimate Italian Army, overlooks too many questions to be really true. Meaningfully, this storytelling looks somehow like the French efforts after 1944 to deny the very existence of Vichy France. Two stories, those of Italy and France in the Second World War, with not so few matters in common. Italian historians have a huge amount of issues to explain. All the things that were done were a mistake: an improvised declaration of war; a sudden series of defeats, resulting in the inglorious request of aid to the powerful ally; two years of war as vassals, with a scarce and antiquate matériel, many realizing to be fighting on the wrong side; a tragically clumsy armistice; an occupation in the South and an invasion in the North; and for dessert, a civil war. The fascist regime was bellicose and militarised still in its infancy. But it is important to keep in mind that the fascist militarism had totally a domestic value for many years. Its purpose was that: maintaining the social hierarchy at a time when, with the birth of the two mass parties, the socialist PSI and the catholic PPI, the old liberal (“tory”) establishment was no more able to rule the country. Fascism represented itself as a “revolution”, but the old upper class of the liberal Italy and that of the new fascist regime were all the same. The Great War was a widely shared experience, and conceiving society as a huge barrack avoided the danger felt by the upper class of a losing of power due to too much democracy. Italian society in the Twenties and Thirties was not really ruled by a true totalitarian regime, but instead by a “troika” composed by Mussolini’s fascism, Savoia’s monarchy and the Pope’s Catholic Church. All this resulted in a Mussolini’s foreign policy which, except for th episode of the occupation of the Greek island of Corfù in 1924, until 1935 aimed at the increasing of Italy’s international prestige, but only by diplomatic means. An episode of this quest for international prestige was the claim of a naval parity with France at the London Naval Conference of 1930. This reveals much of Mussolini’s political psychology: the naval parity was a pure matter of prestige, without considering if Italy had or not the means to build a fleet as great as the French. And after all, with what purpose?